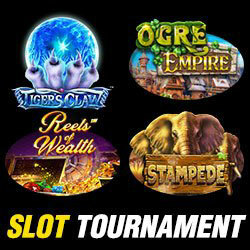 This week's $1000 Fan Favorites Slot Tournament, at Intertops Poker and Juicy Stakes Casino, will feature four of their most popular Betsoft slots: Tiger's Claw, Ogre Empire, Reels of Wealth and Stampede. You automatically earn tournament points when playing any of these games. The top ten point earners will win $1000 in prizes. "Our fan favorites were the four most popular Betsoft slots in our casino in June," explained Intertops Poker's casino manager. "They're all new, high resolution games with lots of features to boost winnings!" Monday, July 23 to Sunday, July 29, you will earn one point for every spin of $.10 or more on any of the featured games. First prize of $300 will be awarded to the player with the most points. Prizes must be rolled over at least once on Betsoft games before withdrawal. Home to the busiest online poker rooms on the Horizon Poker Network, Intertops Poker and Juicy Stakes Casino also have hundreds of unique online slots and table games from Betsoft, Lucktap and Worldmatch. Tiger's Claw is a 3-4-5-4-3 slot game. There are three rows on the first and last reels, four rows on the second and fourth reels, and five rows on the middle reel. This creates 720 ways to win -- many more than a standard 5x3 game. An innovative day/night cycle in Ogre Empire switches up gameplay. During the day, the Ogre is awake and active while the townsfolk sleep. Occasionally, he smashes stone symbols, offering extra rewards. Once night falls, the Ogre drifts to sleep and the townsfolk emerge from their homes, bringing higher pay outs with them. In Reels of Wealth, you collect special Jackpot symbols to win one of four incredible jackpots. As the special jackpot symbols fall into place they explode, allowing other symbols to cascade onto the reels. Stampede pays out for all combinations of contiguous symbols, there are 1024 ways to win. Scatters trigger up to 20 free spins – Wilds during free spins can multiply you wins up to 3X.